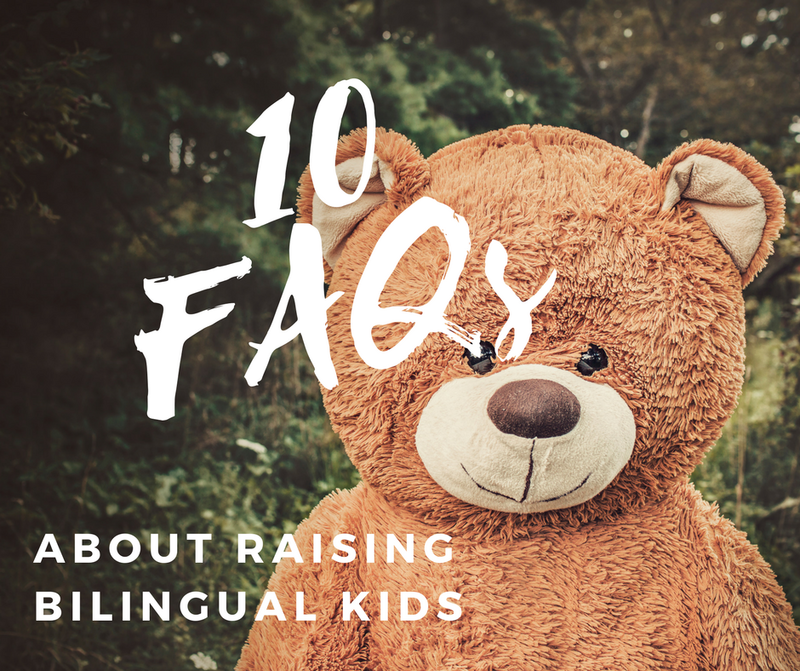 If you are on social media and you read forums on raising multilingual children, you will see the same questions being asked again and again by anxious parents of little bilinguals. I have compiled a quick list of those questions as a kind of go-to guide for parents new to the world of bilingualism. If you are a regular reader, there may not be anything new for you here, but feel free to pass it along as a reminder. Should I wait to introduce a second language? Some older school of thought claimed that it may be better to introduce a second language after the first one has been acquired. This is not the case: the earlier the better, in this case. Start today. It won't confuse your child. It won't damage them. Just go for it. Start gently. Depending on your child's age, play, sing, read books, explain and start talking! Does it take longer to learn more than one language/Is my child delayed? It is not more difficult to learn two or more languages than learning one. Language acquisition is a very personal and variable aspects of learning. Even monolingual typically developing children vary enormously in the speed at which they learn to talk. So, bilinguals will vary too. It may take longer, for example, to learn as many words as a monolingual depending on what is counted and how. But, chances are your child is not delayed because he is 18 months and only says 5 words. However, I strongly believe in a parent's instinct. If you ever feel that there is something wrong, seek advice from a professional who understands the challenges of bilingualism. You might also be interested in this article from a speech therapist about the signs to look out for. Is it too late to introduce another language? It is never too late. Never. Full stop. 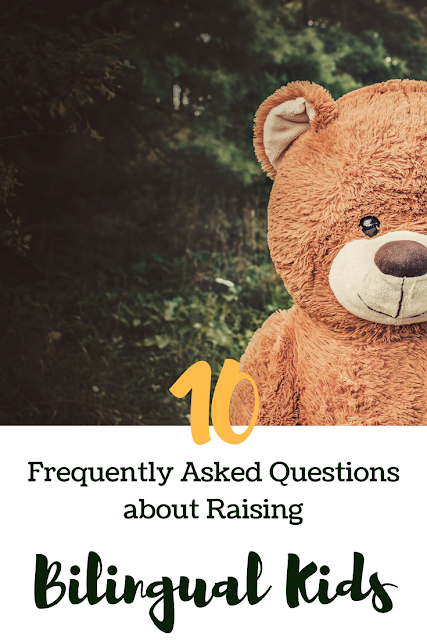 Why does my child refuse to speak my language? Chances are you have not provided enough of a strong need for him/her to speak that language. Children are very clever little human beings. They know that you may understand them in the language they use. Why bother switching? Create a need for the language. A real need. Not some artificial "oh mummy doesn't understand that word" kind of answer. Find other kids, playgroups, activities, anything to make them need the language. I go into more details over here. Is OPOL (One-Parent-One-Language) the best method? Many parents on forums believe that OPOL is the successful method to raising your children bilingually. This myth comes, partly, from the fact that it is the easiest method to study and so much research is focused on families in that situation. However, it is not the best method. There is no best method (like for many other things in parenting). It is a method that may work for your neighbour but not for you. It is a personal choice. You need to assess the pros and cons of each method. Can we switch family strategy? Sure! If something is not working, if you are moving internationally, if your situation changes, changing strategy might be the answer. If your children are old enough to realise it, explain why it is important and why it matters. Get everyone on-board. Should I worry about mixing? Linguistics research has long established that switching or mixing languages is not a sign of confusion. In a lot of cases, it is a sign of highly skilled linguistic skills and can even be a marker of typical acquisition in some communities. You might like to read further about this. Should I drop a language? I have never come across a case where dropping a language was a good idea nobody regretted later down the line. Even children with autism and other developmental delays have been shown to benefit from bilingualism. If you are ever advised to drop a language, get a second opinion. Chances are the person saying this is not a specialist in multilingual children. Should we speak the community language at home to ease the transition to schooling? There is this new trend encouraged by some so-called linguists and experts who claim that children will be at a disadvantage once they reach nursery or school if they don't speak the community language. This is false. If I may say so, this is a feeling supported by nationalists and other political currents lessening the importance of the home language. Yes, it may be tough for a few months. Yes, they may need special help, but in the long run, the advantages of having a strong home language will outweigh the short-term issues. This article makes excellent points about the case for the minority language at home and this is an example of research-backed findings. How much exposure to each language does my child need to become fluent? There are estimates floating around the internet that range between 20 and 30%. But these are estimates and they are not backed by research. They are merely guidelines researchers have used to set their own criteria on how to tell if someone is bilingual for subject recruitment purposes. Read my criticism of how dangerous it is to set talk about this figure. As you will have seen, I like to base my claims on hard scientific facts rather than hear-say from forums and parents. Where to go for reliable research-based trustworthy answers to your questions? Here some sources and pages that can answer other questions. I have selected these because they are written by actual researchers or educators in the field. - FAQs by Johanne Paradis, Researcher in early bilingualism. A handy downloadable PDF by the Literacy Trust. Also, if you want to check my own credentials, here they are.